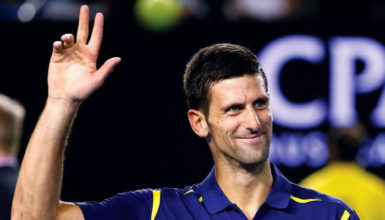 LONDON, (Reuters) – Novak Djokovic made tennis history at Wimbledon yesterday when he notched up the most consecutive grand slam match victories in the Open Era, and said he aimed to continue his assault on the record books. The defending champion brushed past France’s Adrian Mannarino 6-4 6-3 7-6(5) to book his place in the third round. It was his 30th consecutive grand slam match win, beating Rod Laver’s record of 29 set in 1969-70. “I have to be very grateful to have the opportunity to make the history of the sport,” the world number one told reporters. “Knowing that I won 30 in a row, it’s very pleasing. I want to keep on going. Let’s see where it takes me. Djokovic last lost a slam match when he was defeated by Stan Wawrinka in the 2015 French Open final. He now holds all four major titles, and has another historic mark in his sights. The 29-year-old Serb is aiming to become the first man since Laver in 1969 to achieve the calendar Grand Slam – winning the four major titles in a single season. Djokovic, seeking his third consecutive Wimbledon crown, played well within himself during the second-round match against Mannarino and was rarely troubled. The Frenchman, ranked 55, put up spirited resistance in the third set to force a tiebreak but was ultimately swept off Centre Court by his opponent’s laser-guided groundstrokes.